Height: 5’8″ – Weight: 180 lbs. 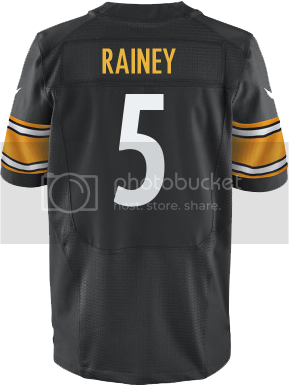 Arguably the Florida Gators’ most valuable offensive starter in 2011 and one of the most naturally explosive players in team history, running back Chris Rainey was selected Friday afternoon by the Pittsburgh Steelers with the 24th pick in the fifth round (No. 159 overall) of the 2012 NFL Draft. Chosen later in the process due to concerns about his size (5’8” 180 lbs.) and durability, Rainey has proven over his five-year college career that he can be a major playmaker when used correctly and provided with an opportunity. He posted the fastest 20-yard shuttle (3.93 seconds), 60-yard shuttle (11.06) and three-cone drill (6.50) times out of the entire field at the 2012 NFL Scouting Combine and also finished with the second-fastest time in the 40-yard dash at 4.45 seconds. Rainey is the first Florida running back to be drafted since DeShawn Wynn was picked with the No. 228 overall selection in the seventh round by Green Bay in 2007. He is the third Gators player to be selected by Pittsburgh in as many years following in the footsteps of center Maurkice Pouncey (2010) and tackle Marcus Gilbert (2011). He will now join his two former teammates on the Steelers and is the 24th Florida player selected all-time by the franchise (most of any team in the league. The Gators have had multiple players picked in the draft 32 years in a row. Can we get a Knicks post-mortem story here. Sure if you want to talk one-sided officiating, flopping, ACL tears and the flu. “Round 3 – No. 159”? must be a typo.